In the shipping business, most people focus on what’s inside the container or vessel. But what about the actual vessel containing the merchandise? Check out this great, informational blog article on Flexitanks, originally posted by More Than Shipping, a global logistics and blog website. In the shipping container business, people mainly focus on the type of merchandise which can be boxed and sorted on pallets. In fact, this is only a portion of what can be shipped in those magical boxes. Handling different type of products is an important segment of logistics, and we utilize different type of containers to achieve that. Moreover, a container itself is not the only thing that we can utilize to handle our unordinary cargoes. We can use various types of packaging techniques to turn a dry van container into a liquid tank, too. The Flexitank was developed by the U.S. military to store and transport water and diesel fuel in the 1960s. It is a bulk liquid storage unit, made of multiple layers of polyethylene, with an outer covering of woven polypropylene. As global commerce expanded, logisticians took advantage of this technology to transport any non-hazardous liquids by simply placing them in a standard dry container. 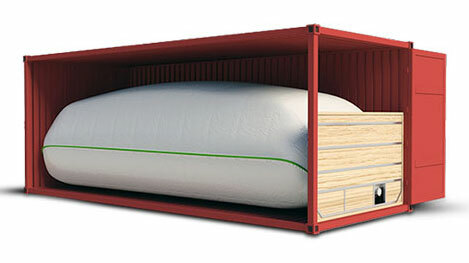 It basically converts an ocean container to a healthier, safer and cost-effective alternative for shippers. Flexitanks are widely preferred for food-grade products such edible oil, fruit concentrates, beverages and non-hazardous chemical transportation due to their high efficiency along with superior protection against contamination. A growing population has also increased the food demand in massive volumes, and this demand positively influenced the food grade and beverage trade across the globe, too. As the major exporter of corn, soybean, oilseeds, and feeds, North America has been the largest player in the bulk container packaging market. However, this trend is shifting to the East now. Increasing edible oil exports from Southeast Asia will bring substantial growth to the industry in the region. Indonesia alone exported more than 14 million tons of palm oil in 2007, and reached roughly around 20 million tons in 2013. More than 30% of this trade was done through Flexitanks, owing to its high operational efficiency, and low cost. China and India, on the other hand, are expected to observe 10% growth by 2020. Along with bulk container liners and flexible intermediate bulk containers, the market size is projected to hit $6 billion by 2024. As the demand increases, logistics service providers need to keep up with market trends, and invest in new technologies to be a part of the new landscape of the shipping industry.